My accessory shot for the day. 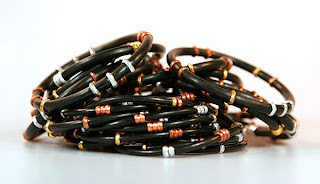 If you want a great accessory for a great cause, here it is The Ubuntu Bracelet Campaign. 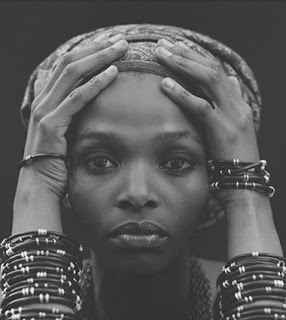 “Ubuntu” comes from the Xhosa word meaning “humanity towards others” and refers to a belief in a universal bond of sharing that connects all humanity — “DO unto others as you would have them DO unto you.” Through Do Act Now’s Ubuntu Bracelet Campaign, you can live this philosophy. DO something. DO Dream Out Loud. DO donate. DO save a mother’s life. DO help a child. DO wear a bracelet.To make a difference now, DO Ubuntu. Your orphan bracelet is handcrafted by local South African woman living with HIV/AIDS using (lead free) copper, brass and aluminum wire. Now matter how many you wear, your Orphan bracelets, will not set off airport security alarms. DO UbuntuDO wear them in the shower. I bought 8, literally. I love them and love the cause...will you buy them? And I just though Ubuntu was the new operating system my boyfriend put on our laptop at home...I'm such a geek! I love the bracelets - simple but elegant. luv ur bracelets whered u get them? Ondine- HAHA!! it is an o/s too! So very cool...I might have to invest in some too!!! Krista- i hope you do! I love the louis bracelet!where are the others from? I love them! totally fab! Hi everyone.. I just want to let you know the DO Ubuntu Orphan bracelet campaign launched a new site this month: http://www.orphanbracelet.org . Buy a bracelet: style and help a child at the same time.